In 1871, while the Great Chicago Fire was riveting the nation’s attention, a blaze six times as deadly was ravaging a desperate town in northeastern Wisconsin. In this week’s episode of the Futility Closet podcast we’ll tell the story of the Peshtigo fire, the deadliest wildfire in American history. We’ll also watch an automated western and puzzle over some discounted food. Harry Mathews composed a poem in which every syllable is doubled. In 1766, French draughtsman Charles-Louis Clérisseau painted a Roman room to resemble a ruin. Denise Gess and William Lutz, Firestorm at Peshtigo, 2002. Peter Pernin, “The Great Peshtigo Fire: An Eyewitness Account,” Wisconsin Magazine of History 54:4 (Summer 1971), 246-272. United States Department of Agriculture, Report on Forestry, Volume 3, 1882. William F. Steuber Jr., “The Problem at Peshtigo,” Wisconsin Magazine of History 42:1 (Autumn 1958), 13-15. Hutch Brown, “‘The Air Was Fire’: Fire Behavior at Peshtigo in 1871,” Fire Management Today 64:4 (Fall 2004), 20-30. Sara E. Caton, et al., “Review of Pathways for Building Fire Spread in the Wildland Urban Interface Part I: Exposure Conditions,” Fire Technology 53:2 (2017), 429-473. Jack Cohen, “The Wildland-Urban Interface Fire Problem,” Forest History Today 11 (2008), 20-26. Lisa A. Schulte and David J. Mladenoff, “Severe Wind and Fire Regimes in Northern Forests: Historical Variability at the Regional Scale,” Ecology 86:2 (2005), 431-445. Robert N. Meroney, “Fire Whirls and Building Aerodynamics,” Proceedings of the 11th International Conference on Wind Engineering, 2003. Stewart Holbrook, “The Peshtigo Fire,” American Scholar 13:2 (Spring 1944), 201-209. Michael E. Telzrow, “The Peshtigo Fire,” New American 22:5 (March 6, 2006), 33-38. John Steele Gordon, “Forgotten Fury,” American Heritage 54:2 (April/May 2003), 35. Tom Skilling, “Was Peshtigo Fire Worse Than the Great Chicago Fire?” Chicago Tribune, Oct. 7, 2018. Chelsey Lewis, “Remembering America’s Deadliest Forest Fire,” Wausau [Wis.] Daily Herald, July 22, 2018, C.3. Michael S. Rosenwald, “‘The Night America Burned’: The Deadliest — and Most Overlooked — Fire in U.S. History,” Washington Post, Dec. 6, 2017. Warren Gerds, “Tin Can May Date Back to Peshtigo Fire Relief,” Green Bay (Wis.) Press Gazette, Dec. 10, 2011, C.1. Jay Jones, “The 140-Year-Old Mystery of the ‘Forgotten Fire,'” Los Angeles Times, Oct. 9, 2011, L.3. Everett Rosenfeld, “Top 10 Devastating Wildfires,” Time, June 8, 2011. Cynthia Crossen, “Deja Vu: In 1871, Chicago Blaze Made News, But More Died in Wisconsin Fire,” Wall Street Journal, Aug. 4, 2004, A.5. Warren Gerds, “Hallowed Reminders,” Green Bay [Wis.] Press Gazette, July 24, 2004, E.3. Greg Tasker, “Worst Fire Largely Unknown,” Baltimore Sun, Oct. 10, 2003. Dennis McCann, “History Seared Into Peshtigo’s Memory,” Milwaukee Journal Sentinel, April 20, 2003, 1H. James Zabawski, “Peshtigo Fire Tale Stirs Sympathy,” Madison [Wis.] Capital Times, Aug. 9, 2002, 13A. Susan Lampert Smith, “Peshtigo Fire Images Burn Hot in Memory,” Wisconsin State Journal, Sept. 10, 2000, 1C. Dennis McCann, “‘Menacing Crimson’ Blaze Raged Through Peshtigo,” Milwaukee Journal Sentinel, Oct. 8, 1998, 2. Jerry Resler, “Where the World Ended Peshtigo Marks 125th Anniversary of Fire That Killed 1,200,” Milwaukee Journal Sentinel, Sept. 15, 1996, 1. Bill Stokes, “Life and Death in the Forest 122 Years Later, Peshtigo Still Bears the Scar,” Chicago Tribune, Oct. 3, 1993, 1. Casey Bukro, “Fire Alarm Recalls Night of Horror 121 Years Ago,” Chicago Tribune, June 23, 1992, 7. “Continent’s Worst Blaze Always Overshadowed,” Washington Post, Oct. 9, 1988, A12. Jay Clarke, “On the Night Chicago Burned, a Storm of Fire Consumed Peshtigo, Wis.,” Chicago Tribune, Nov. 17, 1985, 25. “The Great Peshtigo Fire,” Newsweek, Oct. 15, 1979, 32. Peter J. Burns, “The Peshtigo Fire,” Saturday Evening Post 243:3 (Winter 1971), 88-113. “Town to Correct Error in History,” St. Petersburg [Fla.] Times, Jan. 9, 1954. 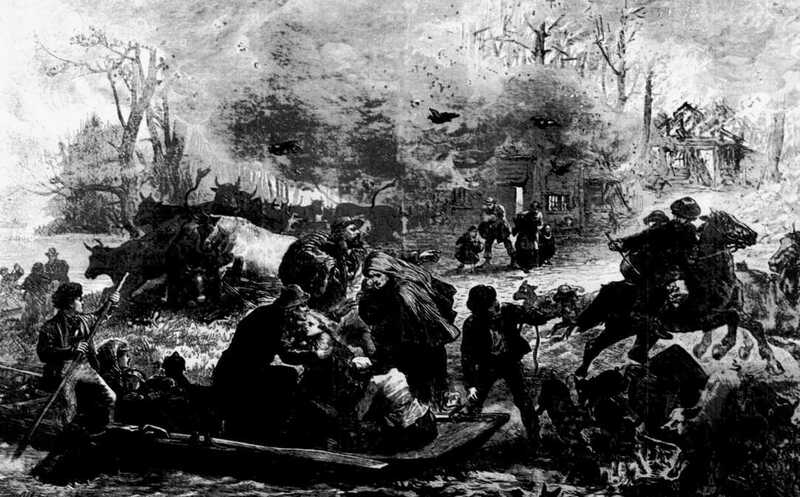 “The Wisconsin Fires,” New York Times, Nov. 13, 1871. “Wisconsin Fires,” The Carroll [City, Iowa] Herald, Oct. 25, 1871. “A Cyclone of Fire,” New-Orleans Commercial Bulletin, Oct. 18, 1871. “The Peshtigo Fire,” National Weather Service. MIT Centennial Film, “The Thinking Machine,” 1960. John E. Pfeiffer, The Thinking Machine, 1962. This week’s lateral thinking puzzle was contributed by listener Michael Grigoriev, who sent this corroborating link (warning — this spoils the puzzle).